The LG LA620V Smart 3D TV offers an immersive viewing experience with crystal clear LED screen and a minimalist slim and narrow design. With brilliant picture quality boosted by LG’s cutting-edge motion processing, is an all-round star performer. With plenty of Smart features to choose from and inbuilt Wi-Fi connectivity, you will never be stuck for something to watch or do on your TV again. The LA620V also boasts smart energy saving features and a USB connection that allows you to enjoy movies, pictures and music stored on a hard disk or flash drive on the big screen. LG Intelligent Sensor technology automatically finds the optimal brightness, sharpness, colour, and contrast picture settings to enhance the picture quality and reduce power consumption. This LG really does have it all. 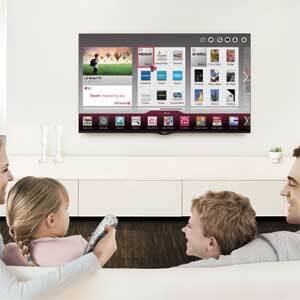 LG’s Smart TV technology* can be accessed directly from the LA620V with built-in Wi-Fi. Open up a world of entertainment with Smart TV: watch catch up TV, Movies, TV series and listen to music instantly. 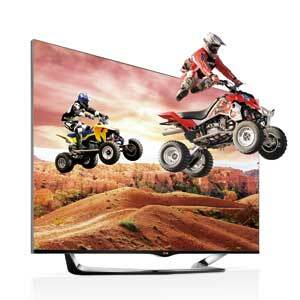 Experience a multitude of popular streaming entertainment and Apps with LG Smart TV functions. A full range of quality lifestyle applications, interactive games, and VOD services designed for individual and family entertainment is all yours to enjoy. *Services are subject to availability and may vary across products and platforms. LG Electronics UK works closely with content providers to ensure services are live and up to date across its range of Smart TV devices. Due to platform upgrades some services require modification before launching on 2013 devices. The Smart Home menu navigation is made easy, with the unique LG Magic Remote* for intuitive control using point, gestures, voice and scroll wheel. LG’s slim depth and narrow bezel design nearly eliminates the space between the screen and bezel so that they can blend together beautifully. This is a TV that looks as good switched off as it does turned on. Connect your LG Smart TV to the internet without any wires with built-in Wi-Fi and bring the best of the web directly to your TV. Cinema 3D TV brings the big-screen 3D experience direct to your living room, so you can share the 3D fun with friends and family from the comfort of your sofa. All LG Cinema 3D TVs are certified flicker-free, meaning more comfortable viewing, less stress on your eyes and a sensational, blur-free 3D experience. It's also simple to share your media to and from other devices using SmartShare from a PC/Laptop, tablet or smart phone. Catching up with friends and family is made convenient with the SocialCenter and the optional attachable camera. LG provides a remarkably advanced and convenient 3D conversion technology with greater 3D effects and depth control, so you can instantly convert any 2D content into deep and realistic 3D. Whereas conventional TVs relied on a split screen or separate sets for multi-player games, LG TVs with Dual Play function transmit two separate 2D images that can be seen through two different sets of polarized glasses. So when two players wear the glasses while playing games, they will each see a different image covering the entire screen. Benefitting from lower power consumption, LED screens produce brighter light and more natural and vivid on screen images. Blacks are deeper and contrast is greatly improved. What's more, performance doesn't degrade and LEDs offer a more compact design; what's not to like? Motion Clarity Index, the maximum number of response signals per second, is a comprehensive indicator of the genuine clarity of fast motion display, incorporating factors beyond mere frame rates. LG’s detailed backlight scanning, advanced panel technology and powerful engine all add to a superb performance in reducing blur in fast-moving pictures. LG Intelligent Sensor technology automatically finds the optimal brightness, sharpness, colour and contrast picture settings to enhance the picture quality and reduce power consumption, ensuring that you always get the best from your content, without wasting money or energy. The Smart Energy Saving feature helps users to be a little greener by limiting power consumption, helping to save energy and money. The feature includes backlight control for adjusting brightness, a screen-off function that turns the picture off for playing audio-only, and the Standby Mode Zero function which allows the TV to effectively hibernate, using minimal electricity. The built-in Freeview HD tuner completes the package for free-to-air viewing in high definition. Providing the best of BBC, ITV and Channel 4 direct to your TV for free with no monthly contract or fee, you can access a multitude of TV programs, all in stunning HD. To check coverage in your area go to www.freeview.co.uk or text your postcode and house number or name to 80560. Miracast allows screen mirroring from mobile devices directly to your TV, making it easier than ever to enjoy your home movies, music and photos on the big screen. *Miracast requires a WiFi network and Miracast certified smartphone. Smartphone firmware update may be required. SIMPLINK allows control of your LG Blu-ray Disc Player, LG Home Theatre System and other LG devices with just one Remote for the ultimate in convenience: Controlling your world of entertainment has never been easier. LG's latest and most advanced Triple XD Engine brings the highest level of excellence in Color, Contrast, and Clarity for the best picture quality and performance. LG TVs are DivX Certified, and can play DivX video up to 1080p HD. Enjoy the vast variety of premium content from the internet through DivX HD. High-Definition Multimedia Interface (HDMI) carries both sound and picture in a single cable from your devices to your high definition TV. Now you can easily connect your games console, satellite box, Blu-ray or Home Cinema System via HDMI for a true high definition entertainment experience with none of the hassle. Connect your digital camera, MP3 player or hard drive through the USB port to show off your latest holiday snaps, music collection or High Definition movies for a true multimedia experience. Connect and watch HD content from your phone on the TV’s large screen with your MHL cable and control it with the TV's Magic Remote. The phone is also charged while it is connected. 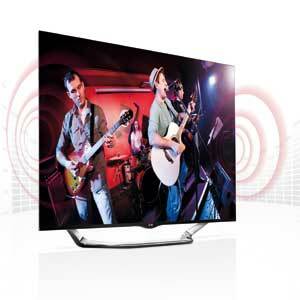 NetCast is the best platform for LG Smart TV, and allows easy access to our various services and content. It is your reliable path to smart life and enhanced entertainment. Cinema 3D TV technology makes LG 3D glasses the pick of the bunch in terms of comfort and affordability, bringing home movie viewing to a whole new level. With four pairs of 3D glasses and two pairs of Dual Play glasses included, the entire family can share in the 3D fun.